Amanda Schoofs creates music that emphasizes presence and spontaneity while exposing the raw and vulnerable qualities of sound and the performing self. Infused with melody and full spectrum timbre her acoustic and electroacoustic compositions are stunning in their visceral coherence. Her artistic practice extends through the American experimental music tradition and exists in the space between academic new music, hybrid arts, and DIY punk and noise practices. Amanda’s music is being presented throughout America, Canada, Europe, and Australia. In 2015 her composition Intimate Addictions was curated by Pulitzer Prize winner Du Yun on the world renowned MATA Festival at The Kitchen in NYC. Her vocal performance of Intimate Addictions was hailed by the Wall Street Journal as “fantastic theater” and described as “courageously elevating the evening to an entirely different level of sophistication,"by I Care If You Listen. Intimate Addictions was performed throughout Germany in 2014, during her Salem2Salem Artist Residency at Schloss Salem. While in residence she recorded her EP Esoterica within an underground water reservoir in the Swiss Alps. The following year Amanda was a Salem2Salem Artist in Residence at Salem Art Works in upstate New York. There she developed a collection of works for percussion and electronics titled Relics of this Black Earth, which have toured the United States with Pillars of Decay. In spring 2019 the album Pillars of Decay will be released on the prominent electroacoustic new music label Irritable Hedgehog. Known for her exquisitely brazen command of extended vocal techniques, and her ability to sing across stylistic genres, Amanda is frequently commissioned to create new acoustic and electroacoustic works for voice/s. Amanda has collaborated with many of Wisconsin’s prominent institutions: Present Music, Wild Space Dance Company, Milwaukee Art Museum, Betty Brinn Children’s Museum (Brinn Labs), FTAM, University of Wisconsin, and Madison Ballet. Nationally her music has been presented by: MASS MoCA/Bang on A Can, BGSU New Music Festival, Columbia/Spectrum (NYC), ISIM/Roulette (NYC), Center for New Music (San Francisco), and Constellation (Chicago), in additional to many other Universities, art organizations, and DIY spaces. An invested academic, Amanda is a 2014 Transdisciplinary Challenge Fellow at Center for 21st Century Studies, researching the cross-disciplinary intersections of language. She is a full-time educator within the Composition & Technology program at University of Wisconsin-Milwaukee. As Senior Lecturer she directs the Contemporary Music and Experimental Improvisation ensembles, and teaches composition, music technology, and theory. She is Artistic Director of Sensoria: Experiments in Sound and Performance, currently celebrating its fifth season of commissioning and presenting new works. A proud Mills College alumna, Amanda holds a Master of Arts degree in Composition. At Mills Amanda studied with luminaries: Pauline Oliveros, Roscoe Mitchell, Zeena Parkins, Joëlle Léandre, and Fred Frith. While training as a composer, she fell madly in love with free improvisation. 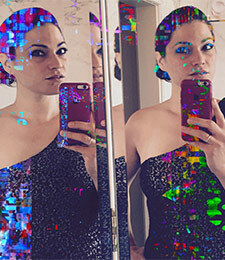 Over the last decade, she has performed as a vocalist and electronic musician with many exceptional improvisers, working across disciplines, both throughout the United States and abroad. Before her tenure at prestigious Mills College, Amanda earned dual bachelor degrees in Composition & Technology and Vocal Performance from University of Wisconsin - Milwaukee.